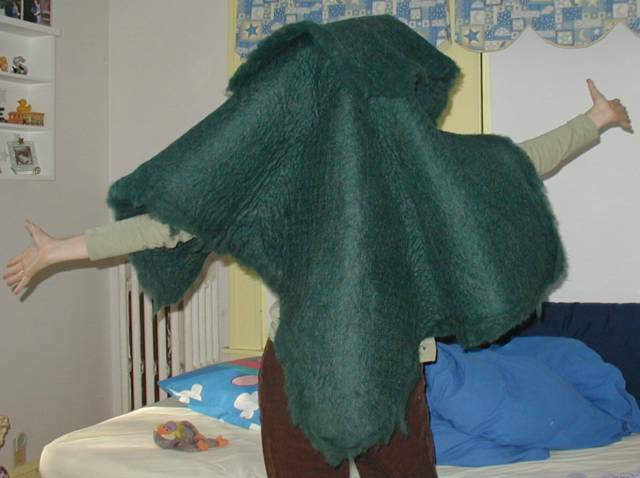 Knitterpated: The Creature From The Green Lagoon Says, "Happy Halloween!" The Creature From The Green Lagoon Says, "Happy Halloween!" This is a very nice 3x4 foot green wool felt batt that I bought at Rhinebeck, which is destined to become a poncho at some point. I plan to decorate it with needle felting and whatever else strikes my fancy. First, I need it to be square in order to work well as a poncho, so I'll have to cut some off one side and then do something interesting on that edge since it won't quite match the texture/style of the other edges. And oh, I should probably cut an opening for my head. *Please excuse the messy kids' room background of this photo; my daughter's bureau is the perfect height for taking photos using the automatic timer, but the decor leaves a bit to be desired. Guess I need to find some alternatives.